Do you see that smile???? Isn't she the cutest little thing ever? Meet Marlee! She is in my son's class at school and believe it or not her mommy and I used to play volleyball together many moons ago. This sunshine always always always has zebra print on somewhere. 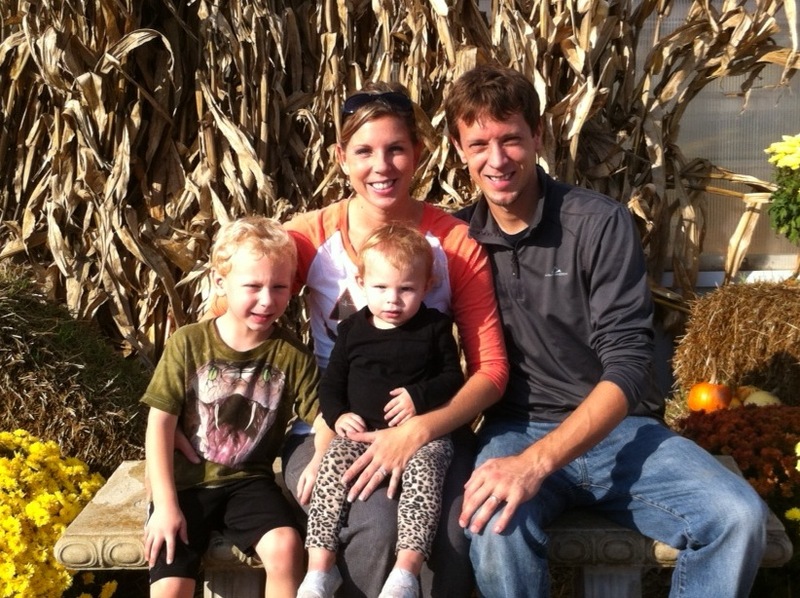 I think her mom has shopped everywhere in America just to keep up her zebra print wardrobe. 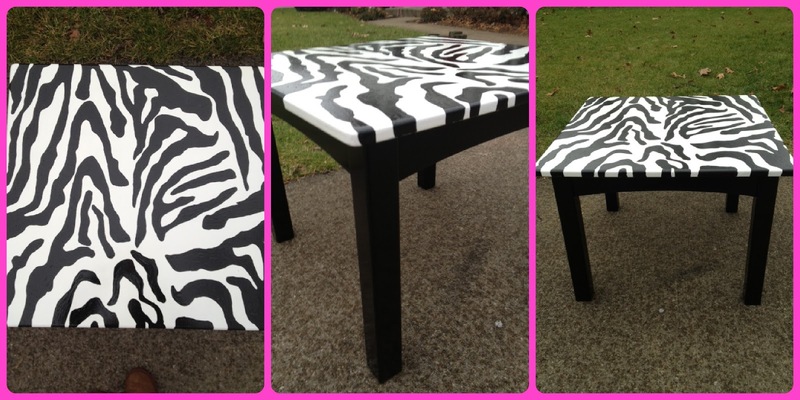 Well, her mom asked me to paint a plain table she already purchased for Christmas, with of course.... you guessed it.... ZEBRA PRINT! I was so excited to be able to be apart of this little girl's Christmas surprise as well as try something I have never done before. 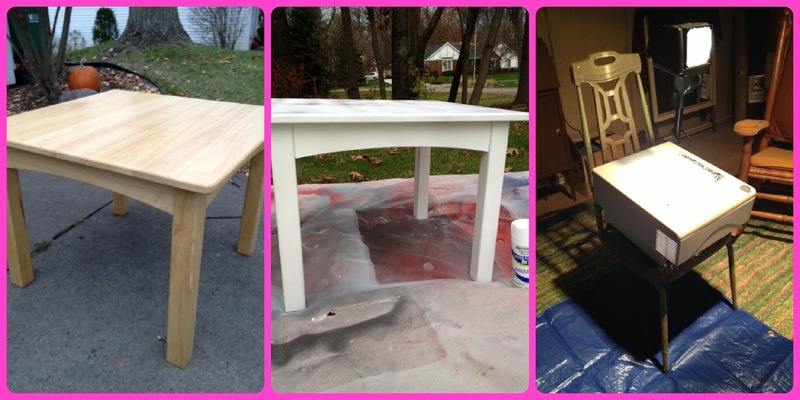 You can see in the first picture that the table came to me as a blonde wood color. It did have a glossy finish on it so I had to sand it off. It took me a whole 15 minutes. Next, I spray primed it. It is so cost effective to just buy the $6 spray primer than to buy a can of primer and brush it on. I primed, waited about 30, and then primed again. You will see in the next pictures that I simply painted the base of the table black and the bottom white. I did use a brush for the black and a roller for the white to keep it extra smooth. 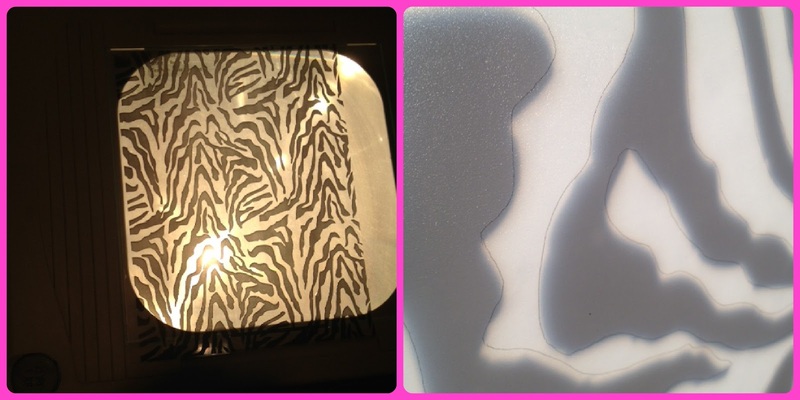 Then, I borrowed a projector from the school and of course made a transparency with the zebra print on it (sounds like cheating, huh?? more like lifesaver!!!). To the left is a pic of the transparency and to the right is a pic of how I traced it onto the table. Easy peasie!!! Once my tracing was complete... I used the same black from the legs to color in the stripes. Here is my hint of all hints!!! A huge thank you to Grandpa Johnny who sat with me through the process... make sure to draw an "X" in the areas that you want to color in. Once I turned the projector off... I couldn't tell what was to be white and what was to be black. Phew... thanks for Gpa!! Here is Marlee's room and the future home of this table!! Oh I can not wait to see pictures of Marlee's face when she sees it!! Mom- don't forget to take lots of pics for me!! Speaking of mom... she has it hidden somewhere super secretive along with the amazing chair she personalized just for little Miss M!! On that note... Happy Holidays everyone! I hope your holiday is merry, bright, and just a tad "wild!" Need a last minute gift for your niece or nephew?? 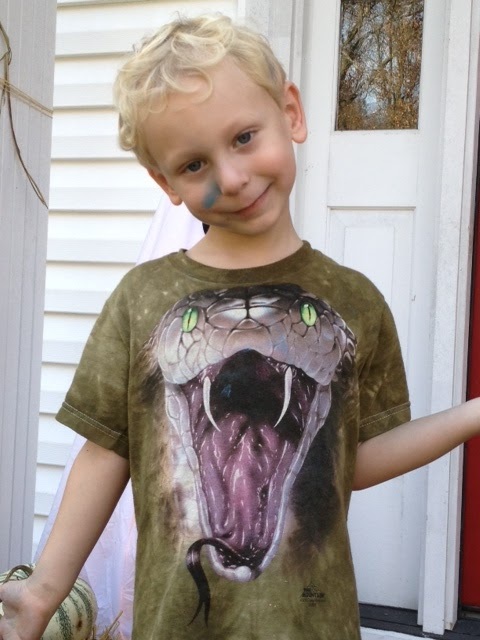 Need a holiday shirt for your little ones to wear on that special day?? Maybe even a baby shower gift?? I've got you covered. My good friend, Meg is so creative. I don't know how she does it with two kiddos at home, but she does and her work is to die for! 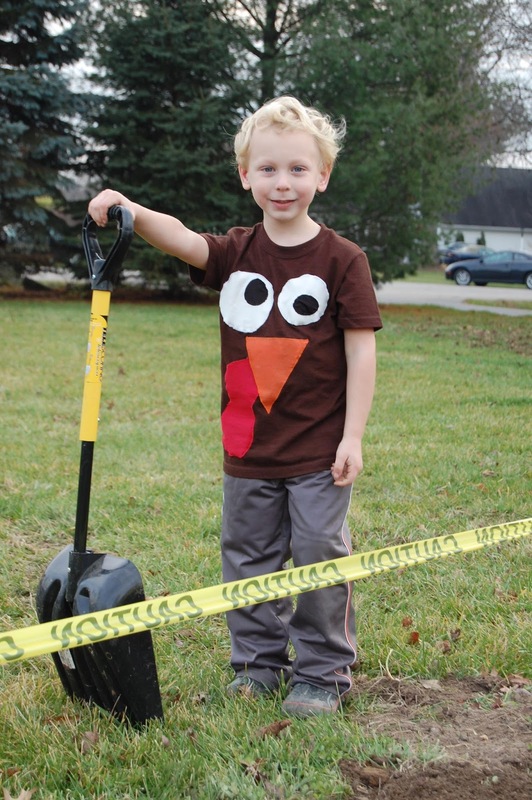 Check out the turkeys below (hahaha- aren't they the cutest??)! My kiddos are modeling just 2 of the bazillion pieces Meg has done. 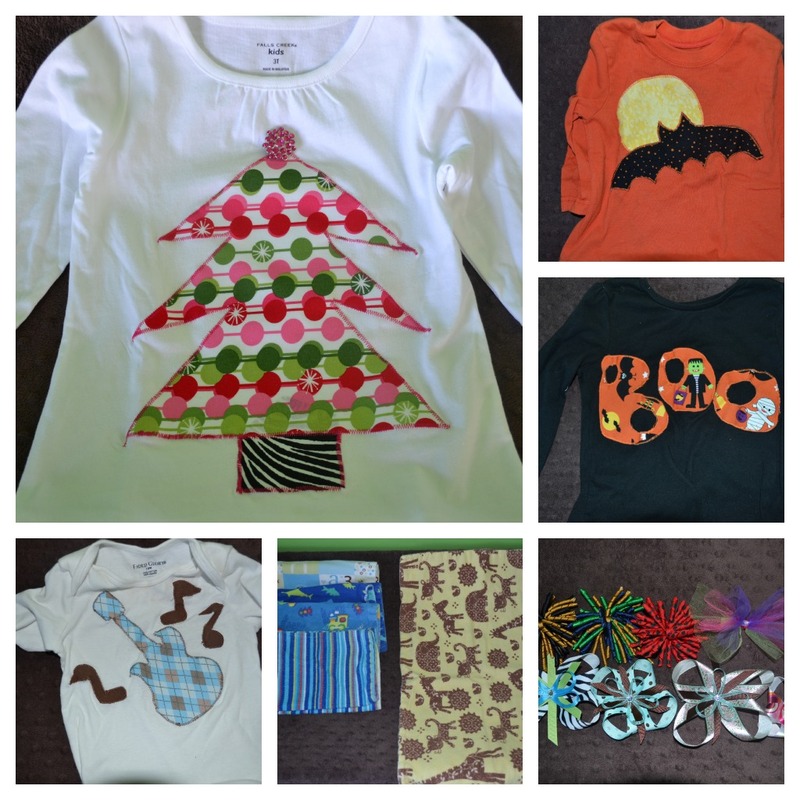 She can make one-of-a-kind shirts, onesies, sweatshirts, hoodies, burp rags, and more. 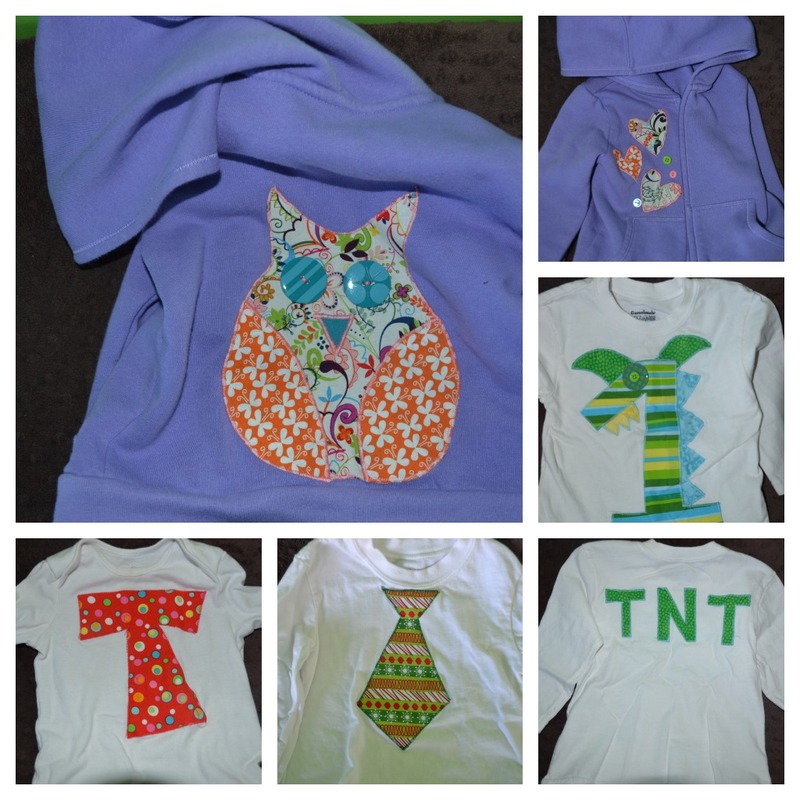 Here is a small collection of her designs! I'm thinking about ordering an owl hoodie for myself!! So darn cute!! I'm in love with this Christmas tree shirt!! 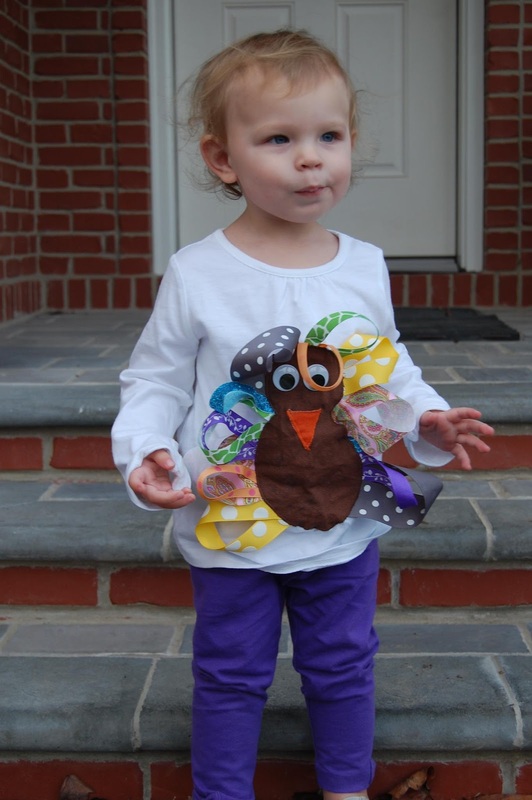 I can not wait for my Quinny's hair to grow a little more so I can plop an adorable bow on top! If you need that last minute gift, just let me know! I can get you in touch with the ever-so talented, Meg!! The possibilities are endless!! Christmas is magical and it should be enjoyed by all ages. I have color everywhere... not just your typical red and green. I mix gold and silver, white lights and colored, and I purposely mix old with new. Here is a tour of Windover Lane...enjoy! I let the kids decorate the tree even if it isn't perfect. The season is about them, right? Who cares if there are 3 ornaments on one branch or none at all on the bottom half of the tree (Quinn steals them and runs) lol?!?!? We don't have a traditional star on top but instead some sparkly sticks. Santa's cookie plate and Santa book come out every year. 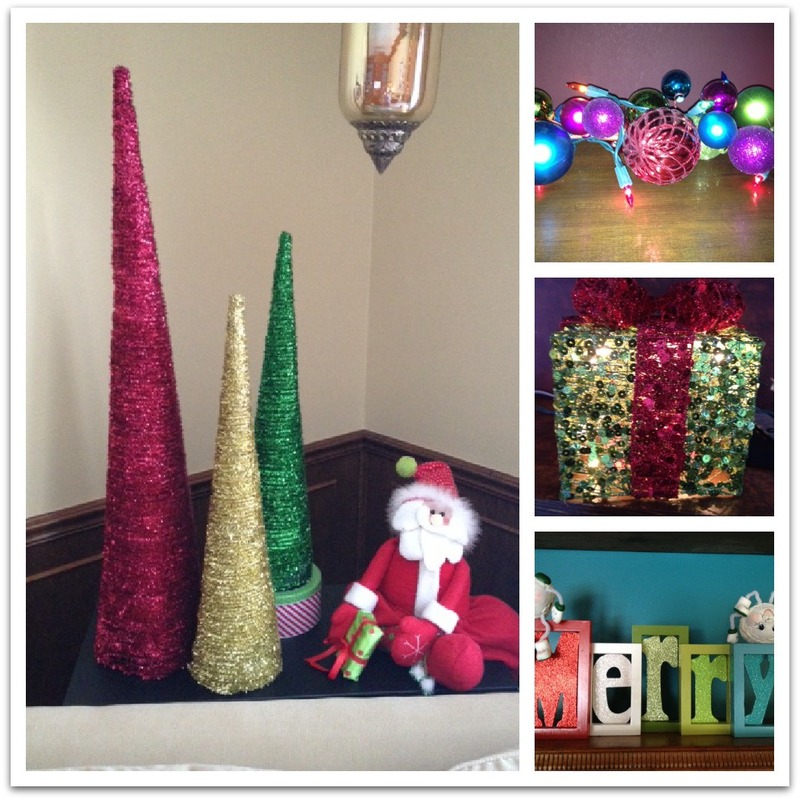 My glitter trees are my favorite (even though my husband hates them and all things glitter). The deer were hand-me-downs and I adore them on our piano. The ornament poofs and basket I made myself and the gift box of ornaments came from a friend's wedding. The three trees pictured have been used for swords, unicorn horns, as well as hats - bahahahha! They have seen better days, but work perfectly for some height behind my couch. The bright-colored garland pictured sits on our fireplace under our TV. It was from Target and I simply wrapped it in white lights for a pop. The light-up present was from TJ Maxx and it works perfectly next to my garland. "Merry" also came from Target, but to add a little fun I placed the snowball guys on top (they were my Grandpa's and I can still picture where they used to be in his house :). 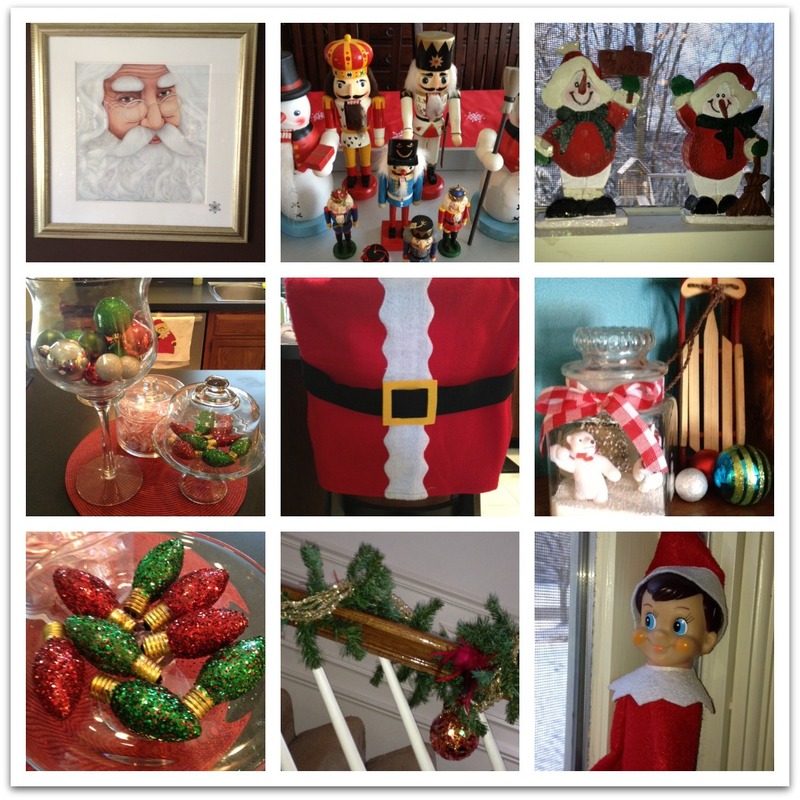 These are just a few of my favorite, favorite pieces in the house: Santa picture placed above the couch, the collection of Nutcrackers, Santa suit seat covers, handmade snow globe, glittery old lightbulbs (made by Charlie), the garland on the stairway, and of course.... Murphy - our elf. 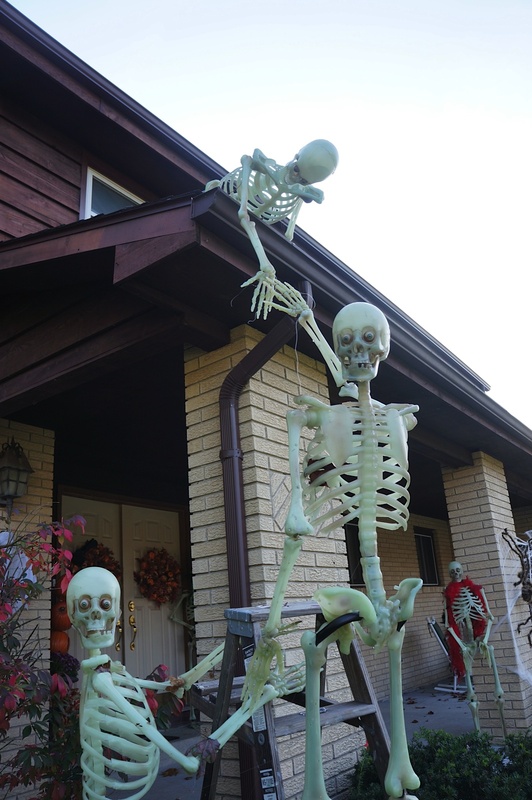 He brought a friend this year to help watch over the other rugrat, too. The look on the kids' faces when he moves is priceless. Simple garland with some dangling ornaments sets the mood in my dining room. My gorgeous tree art came from a close friend, Julie. She is an amazing artist and it warms my heart every year to bring it out knowing it's personalized just for my family. 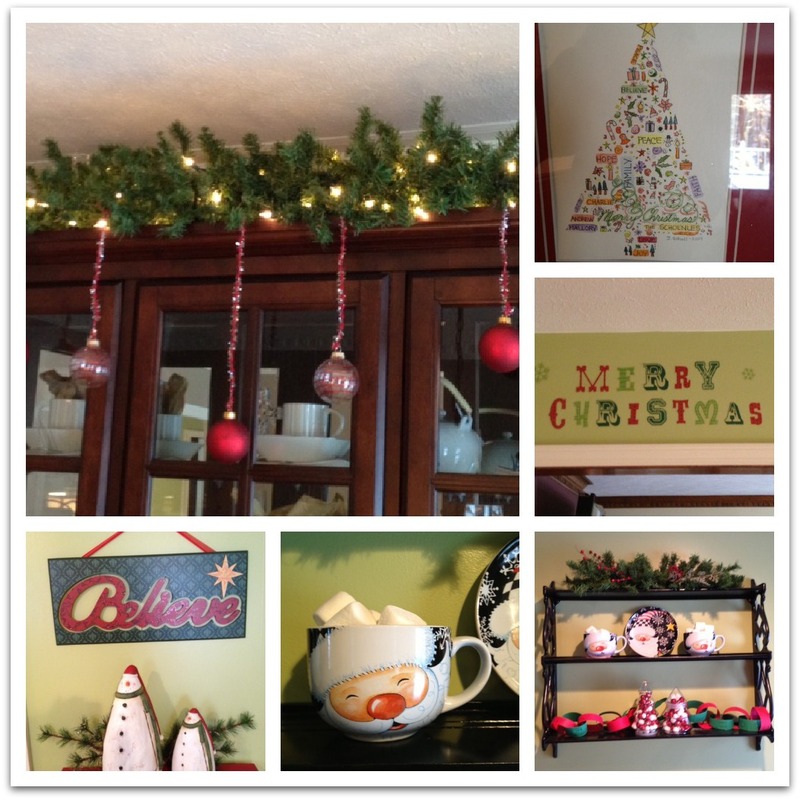 The Merry Christmas sign is a stick-on wall decal from Hobby Lobby. You can see it right when you walk in the door. I kept my shelf simple with a Santa plate and mugs from my Mom (filled with marshmallows), glass trees from Goodwill (filled with red/white balls from HL), and a handmade countdown chain (from my sis). The Believe sign came from my momma, too. It was the perfect fit for my narrow wall! Every year I try to do something different for the Advent/Christmas countdown. This year, Charlie is really into jokes, so I put up a small tree in our kitchen with Christmas clothespins. Attached to the pins are funny jokes about the season. He loves them so much sometimes we do more than one a day. :) The Santa in the right hand corner was from my Mom. She sent it to me when I was in college filled with my favorite candies! I make sure to bring him out every year along with some sweets. Finally, I also wrapped 24 Christmas books for us to read before bed. We unwrap one book every night along with a special treasure. I love getting mail in general so getting Christmas cards almost everyday in the month of December is a present in itself! I literally run to the mailbox, partly because it is so cold outside, and because I can not wait to see "who" is in my mailbox!! How can you not smile at the gorgeous pictures that come in the mail?? They certainly brighten my day. 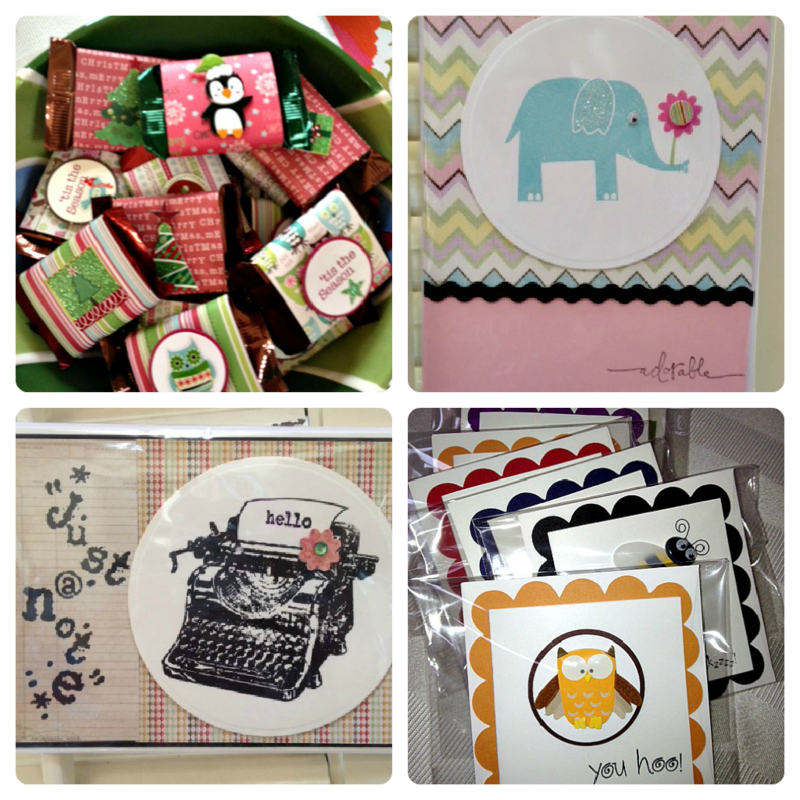 That is why I keep our cards on a ring in a little red basket right on our kitchen table for all to flip through! I feel like I have been away for a long time... maybe because I have! My apologies... I have been sick for about a month and as soon as my sickness went away the kids got it. Go figure!! Anyways, I am back and painting my tail off again. I had to move from the inspirational garage (hahah) to the ever so comfortable basement of my Grandpa Johnny's. I am a wimp when it comes to being cold! But, how can you not be inspired by this fine specimen? He is my number one fan and always feeds me on my breaks. :) I told you I needed a workspace!! He doesn't charge me rent so I think I am staying! Anyways, back to my "WORK." Remember that chair I had posted a long while back? 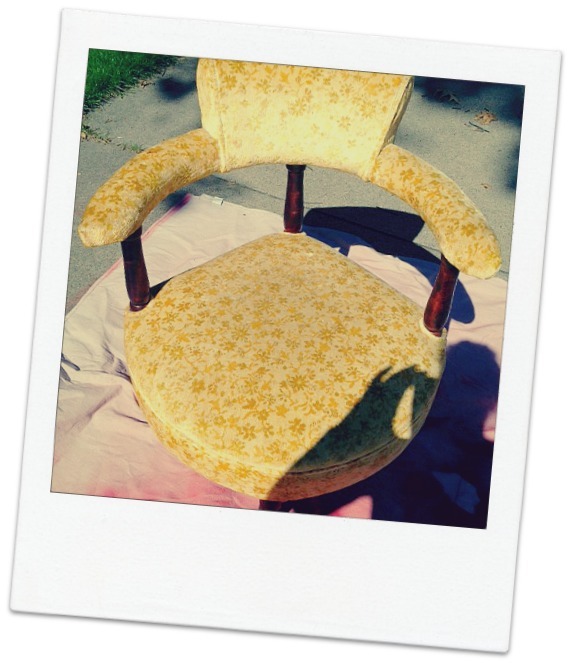 The little, yellow, old telephone chair???? Well, she has been transformed and being used for the holidays!! I dyed it red using that awesome spray dye from Hobby Lobby, painted the arms green with white polka-dots, and the final touch was the furniture tacks. Unrecognizable!?!?!? Here she is at her new home... at a Photo Shoot! I met a lady by the name of Tonya Surbaugh. 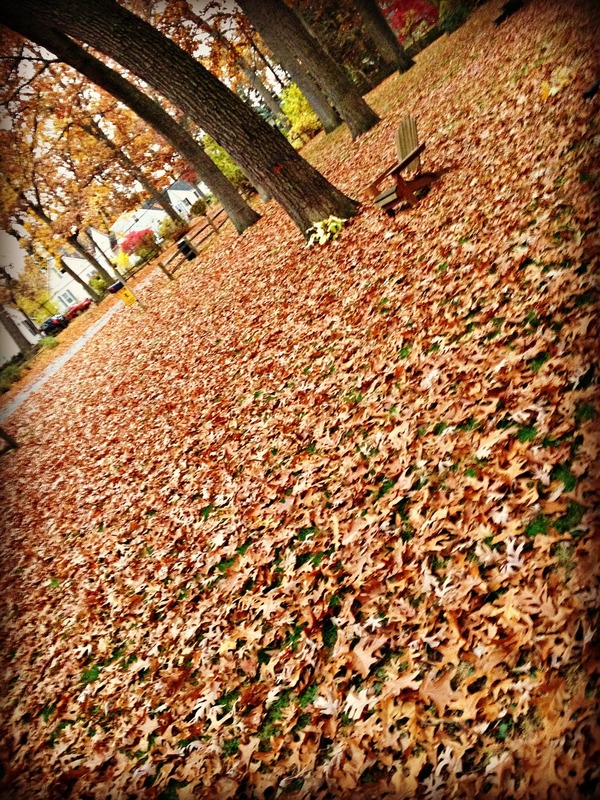 She is an up-and-coming photographer in the Elkhart area. Her work is so much fun and just makes you want to smile. 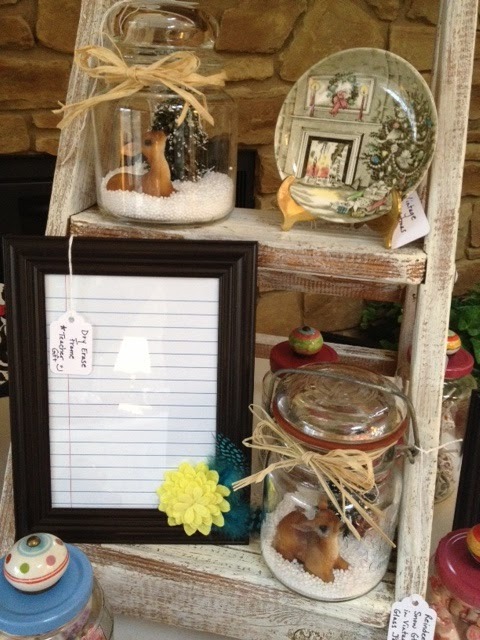 Here are a few more examples of her work. 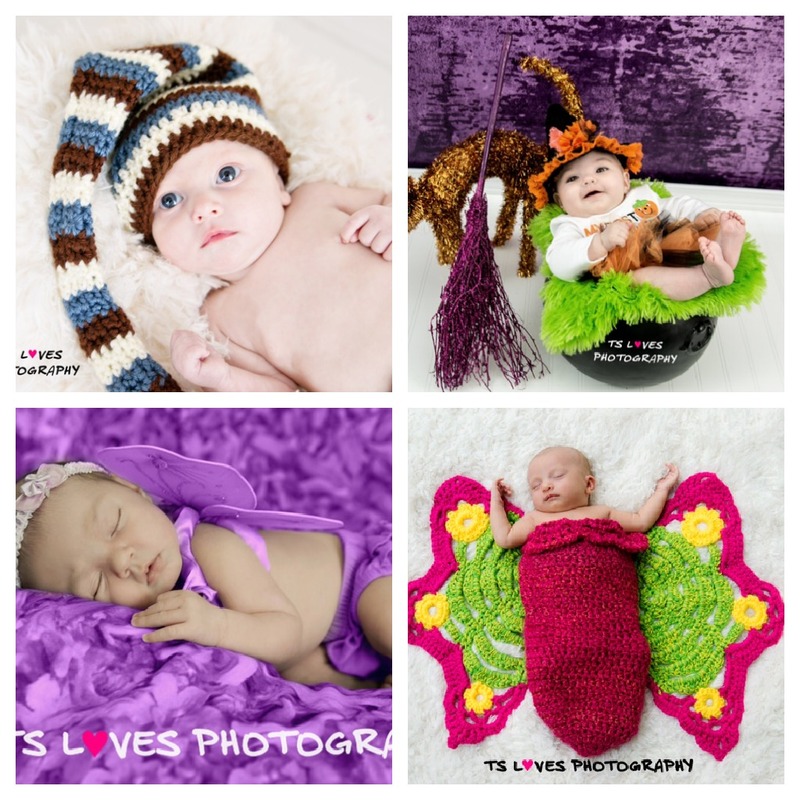 These adorable pictures kind of make me want to have another baby... I said "kind of!" We.Will.See! e-mail me for more contact info, as well. About a month ago I posted this picture onto Facebook to figure out what color to paint it. I received numerous suggestions... to name a few: black, teal, yellow, old white, plum, even the Sistine Chapel! Unfortunately, I did not go with any of those... haha. Sorry to those who gave suggestions (I truly appreciate it), but I found someone who just "had to have" this piece so I had to go with what the buyer wanted. The individual that wanted this piece has a great eye for color. The colors in her house just make you smile. 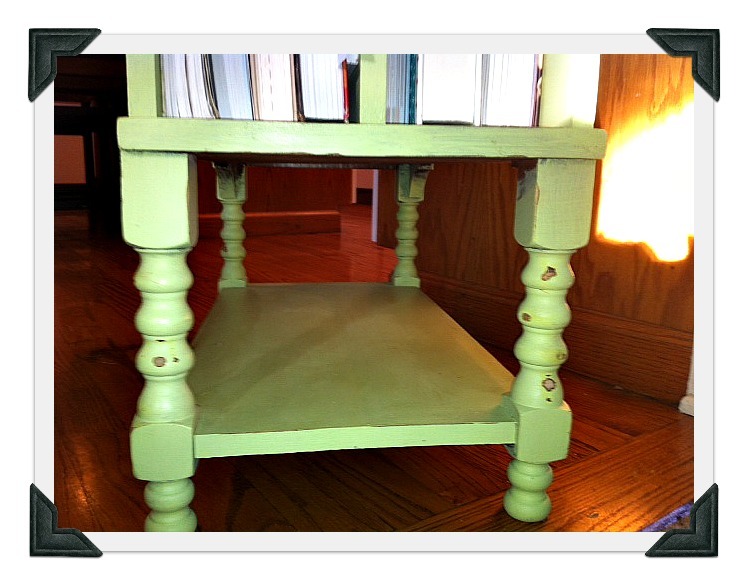 She chose Behr Asparagus for this very old and one-of-a-kind magazine holder/sewing side table. All in all it was in pretty good shape. 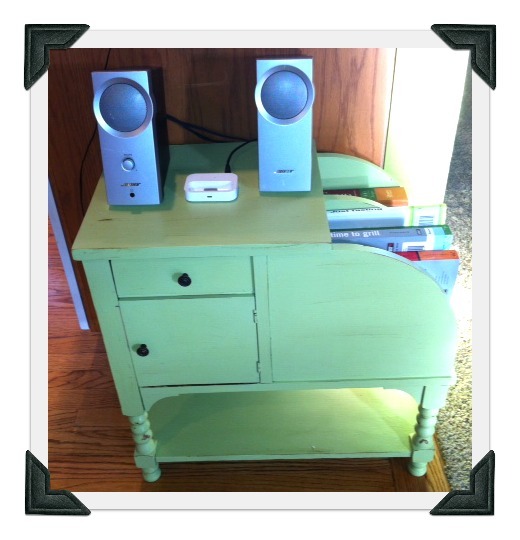 A little glue, a little sanding, some paint and ta-da!! 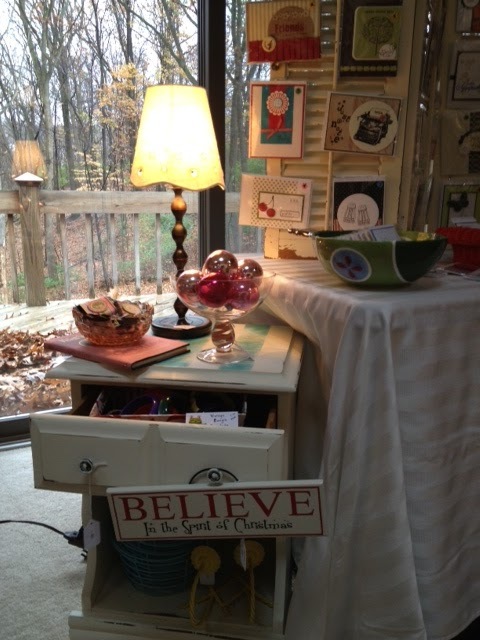 Here it is used as a cookbook holder/media table in the heart of the home... the kitchen! Here's one more green goody I did for the show and sold right away!! It's an old shoe shine box turned storage box. Well, I did it! I'm officially a millionaire!! Just kidding... but I did survive my very first show! It was so much fun and so much work. I am still recovering from standing all day (12+ hours to be exact)! I can not believe the turnout and the amazing friends and family that came to support me. First and foremost I have to give a shout out to my mom and sister. My mom watched the kids for me, helped me finish projects, loaded and unloaded all of my treasures twice, and sat with me all day long to take money. My sister even took the day off of work to help me get through the show. We were sardines in our area, but we had a blast. I will definitely do it again (but only with their help...lol)!! Thank you to everyone who stopped by and I apologize for those I was unable to chat with. It means the world to me to know I have so many followers. When I started this furniture stuff and then decided to blog, I would have never guessed that it would take off the way it has. I am seriously holding back tears as I type this. I AM the blogger that posts a piece and then checks every five minutes to see how many people have viewed it and then high-five my husband as the numbers go up. For those that could not make it to the show (my dear Fort Wayne, FL, and AZ family)... 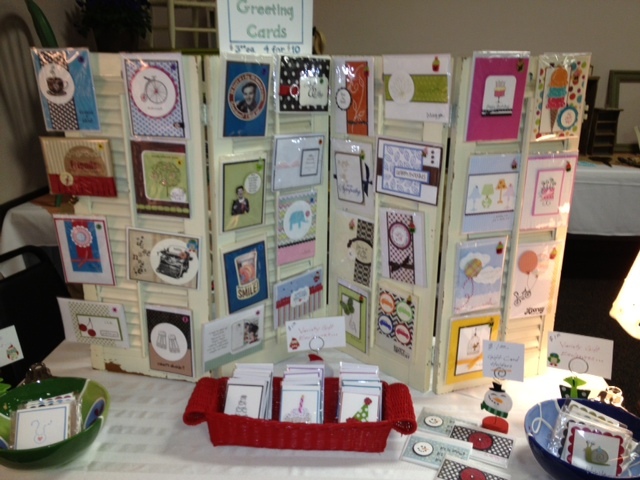 I have a few pictures from the show. As you walked into the building and went down the hallway I was the first booth in the building!! Lots of traffic and it was awesome! Believe it or not... every single seat crate sold and I even have an order for 3 more!! 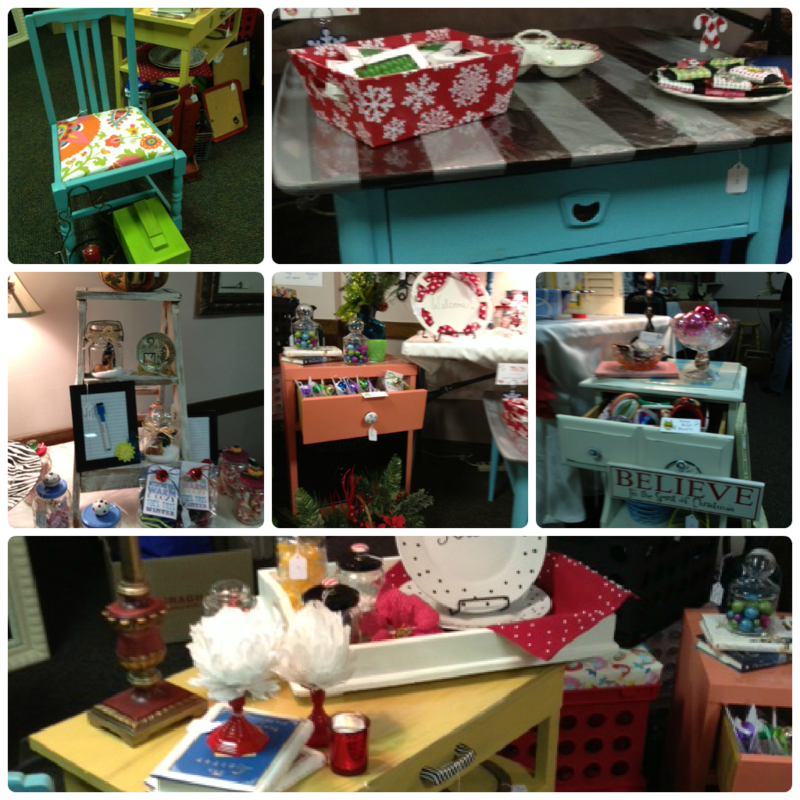 Most of the furniture sold as well. You know what that means???? More shopping!!! Here are some close-ups of some of my personal favorites. I love her stocking stuffer candies and her owl mini cards. They are perfect for presents. She works so hard on her cards and you can certainly tell. The vintage typewriter was a favorite at the show, too! The rush to get ready for the show is over, but the rush in finding new pieces is on! Thanks again!! Sooo I am a big dork, but at least I'm not afraid to admit it! 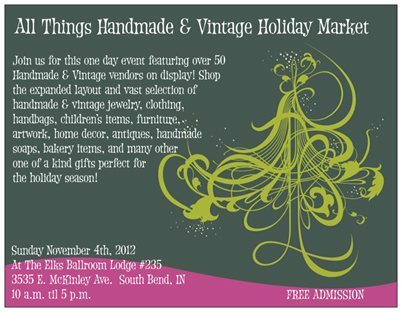 This Sunday will mark my first ever craft show. 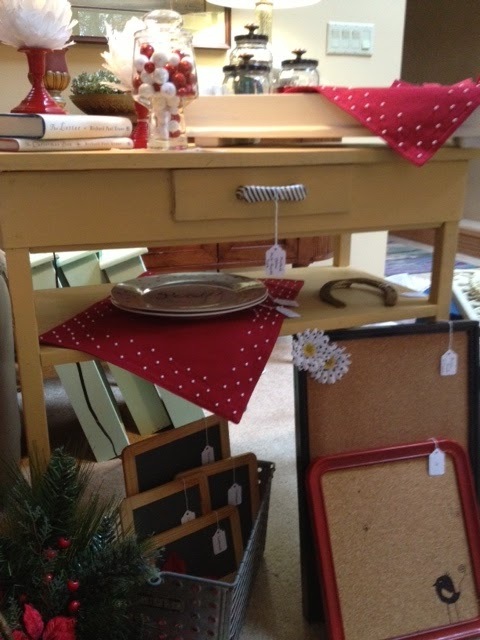 As most of you know, the All Things Handmade and Vintage Show is only 5 days away. I have been a nervous wreck, but in a good way. I decided to do a trial in my mom and dad's living room. LOL!!! I measured it out 10x7 and staged away. 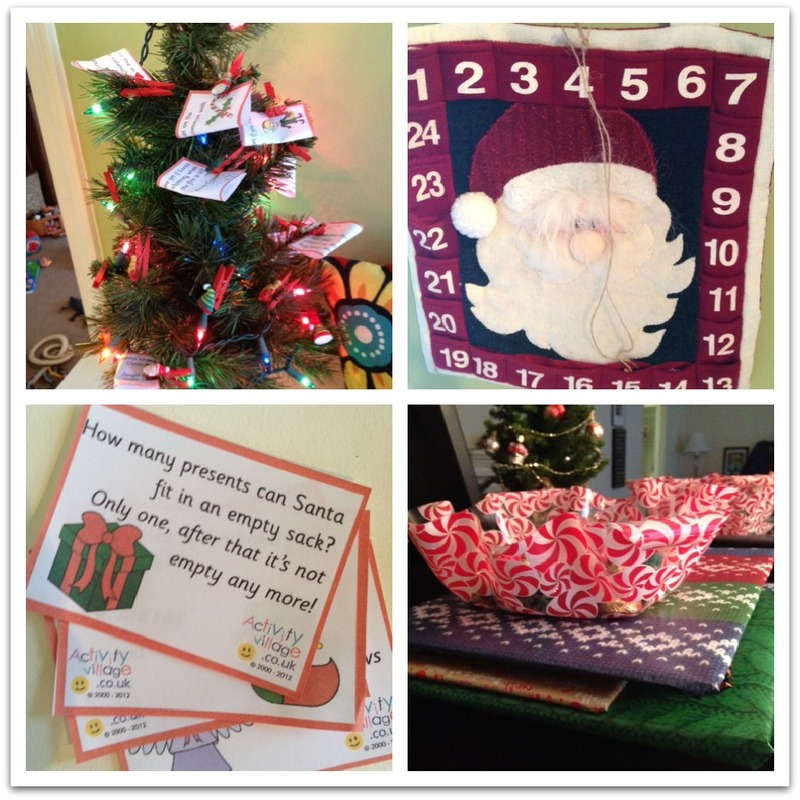 I had to do it there or my kiddos would have destroyed everything in my own home!! Anyways, here is a sneak peek of what will be in my booth! PuPuPuPulease come to the show????? 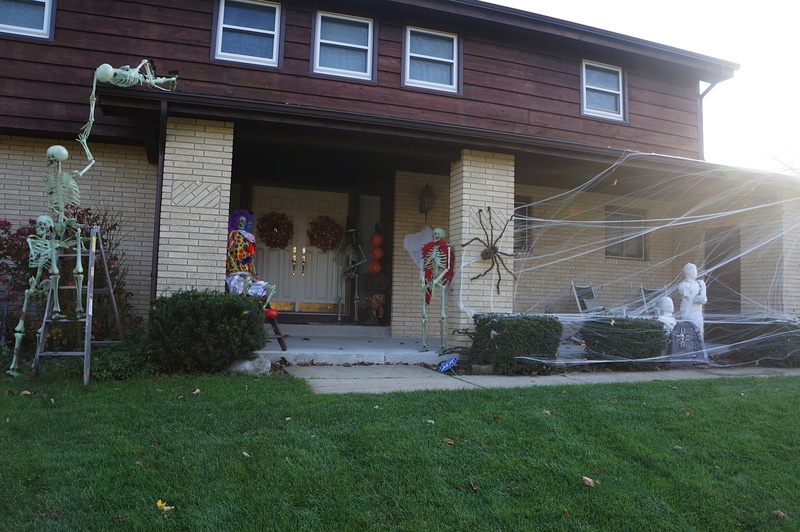 Anyways, I wanted to share with you the Schoenle front porch as well as a few of my close friends' and even a relative. We try to keep our house pretty simple. 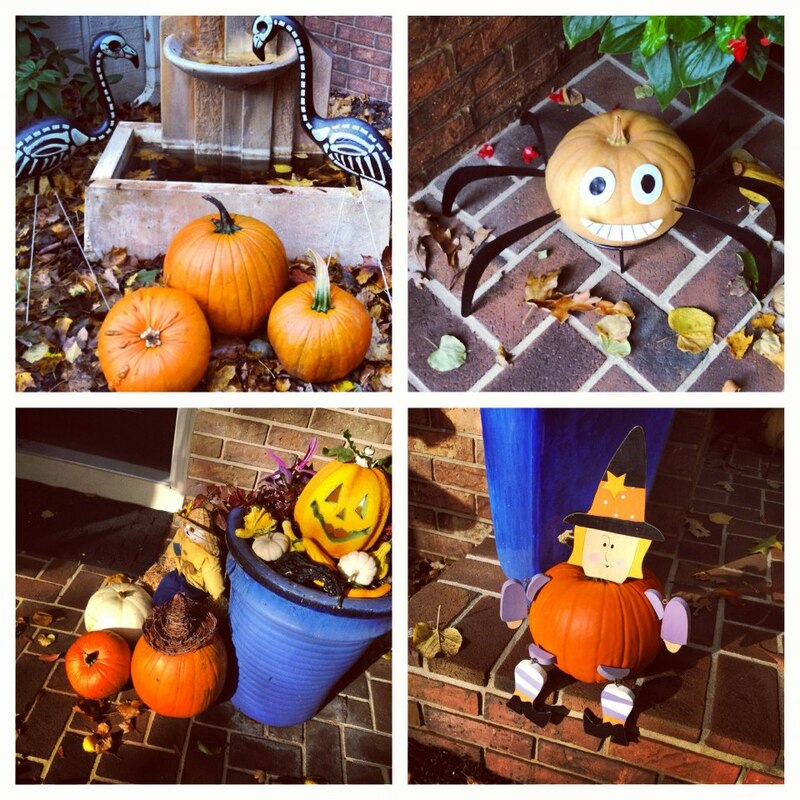 We mainly stage our house with natural things: pumpkins, gourds, hay stacks, and corn stalks... 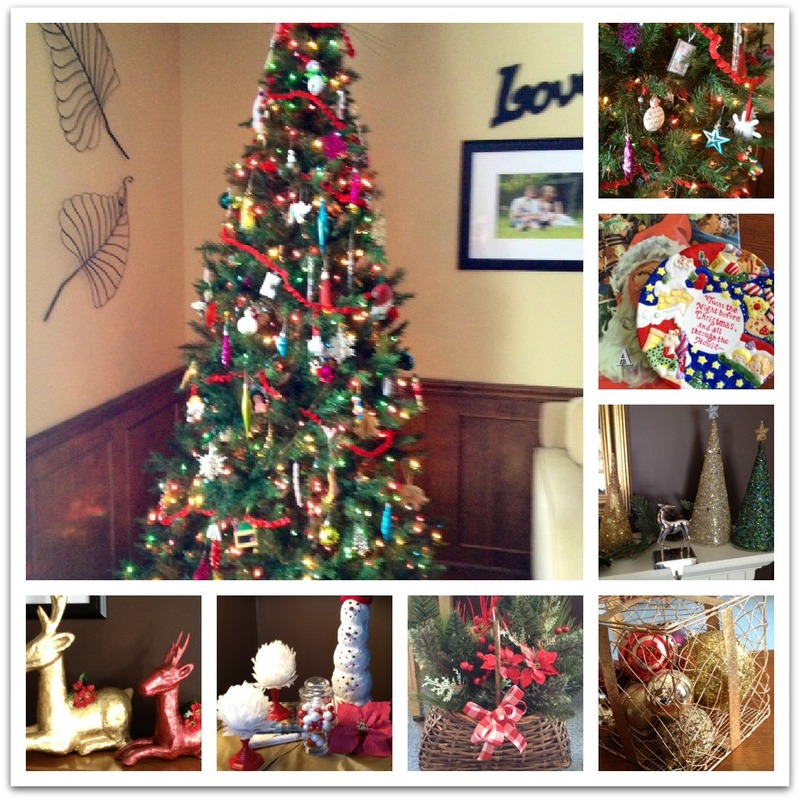 I like to add something new/different every year, though! "Velcome" to our home! Muhahahah!!! Bought the pot you see there along with his brother last year. They were blue but I sprayed them to match our house better. I love my $2 plant stand find. Adding height makes your eyes wander. 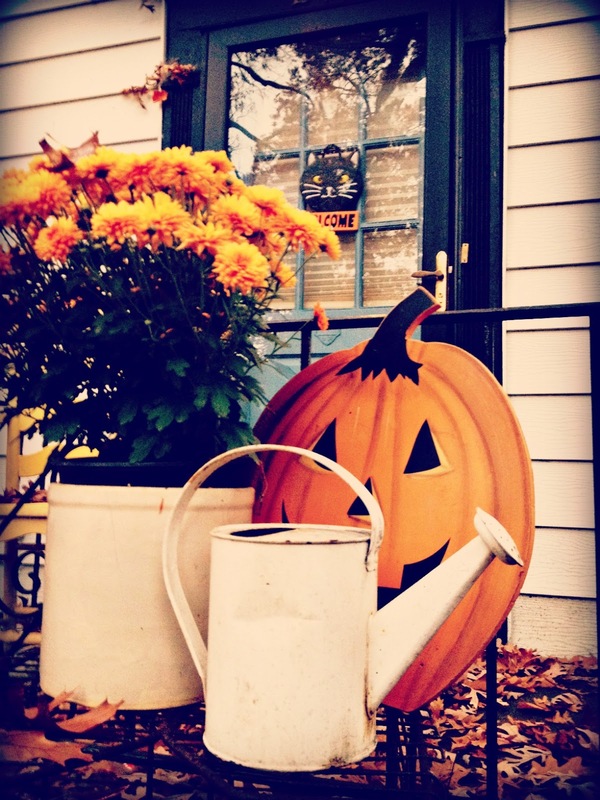 I filled an old vase with some corn and pumpkins, too. This was my new piece last year. 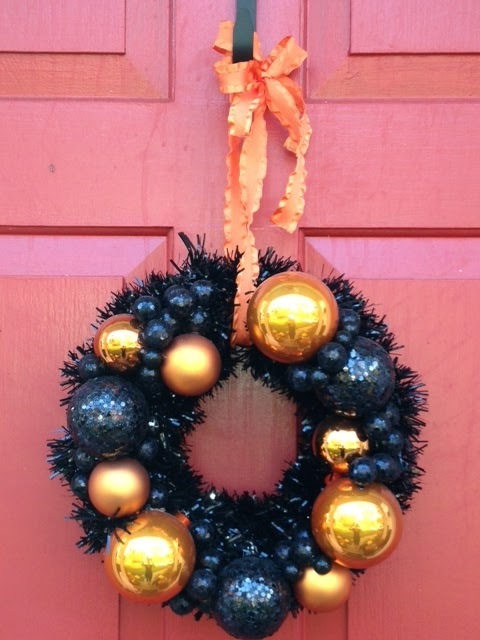 I love love love my vintage Halloween wreath. My friend, Katie, made this for me last year. It is definitely my bling outside. 3.) 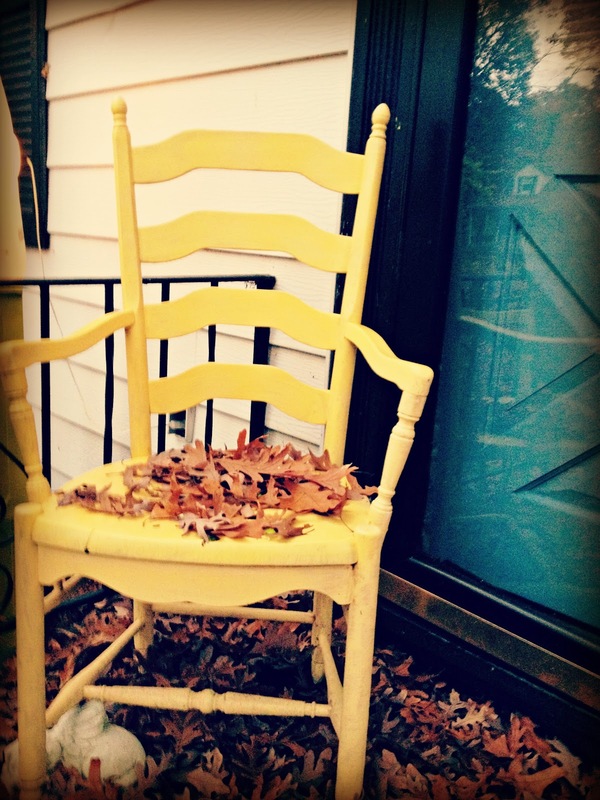 My yellow chair is a new fave this year. $2 at a yard sale and I slapped on some yellow paint. I literally slapped it on in about 10 minutes and just left it. I knew weather would naturally wear it so I didn't want it to be perfect. 4.) 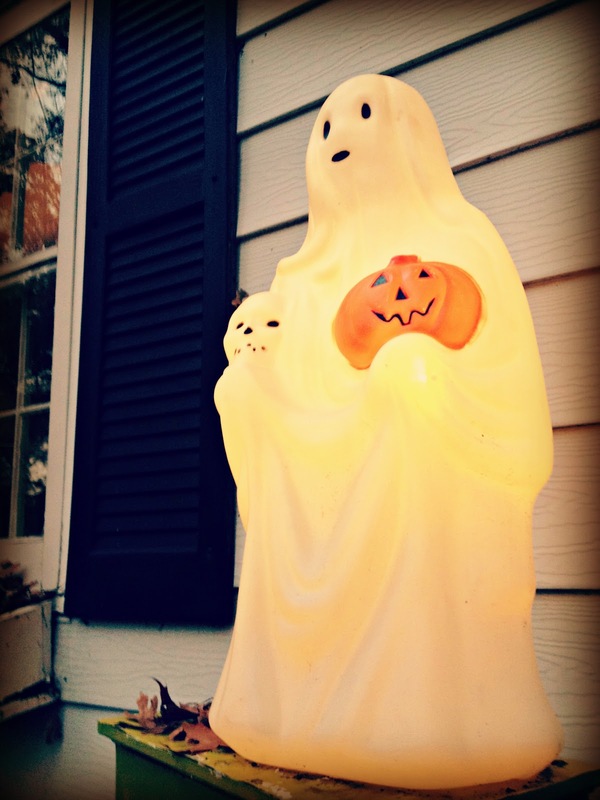 I love love this vintage moulded plastic ghost. It is 1960's, super adorable. This stuff was made to last, and it has. I put it outside and have just plugged it in and let it go. It still works, and works well. $4 at a thrift store. 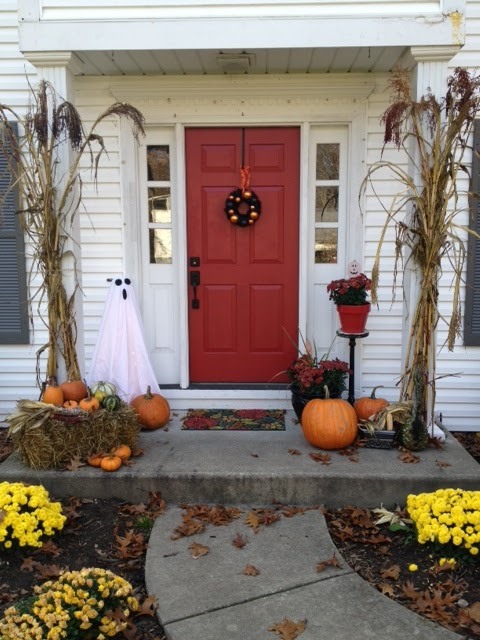 Add in $12 worth of mums and this year's yard was put together for about $20. I love that. Our house is a relaxed and no fuss cottage style so we just like to keep it easy and natural. Oh, and fun. 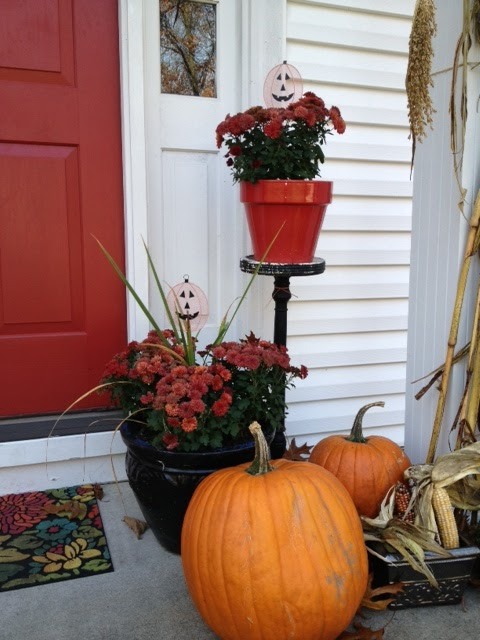 :) Because of the insane amount of squirrels we can't put pumpkins out til the few days before Halloween, but that is ok. Everything else does the job! Isn't she so creative?? Her inexpensive finds make me jealous. If anybody can do it on a tight budget; Katie can. She just recently redid her Master Bedroom for under 100 bucks including bedding!!! 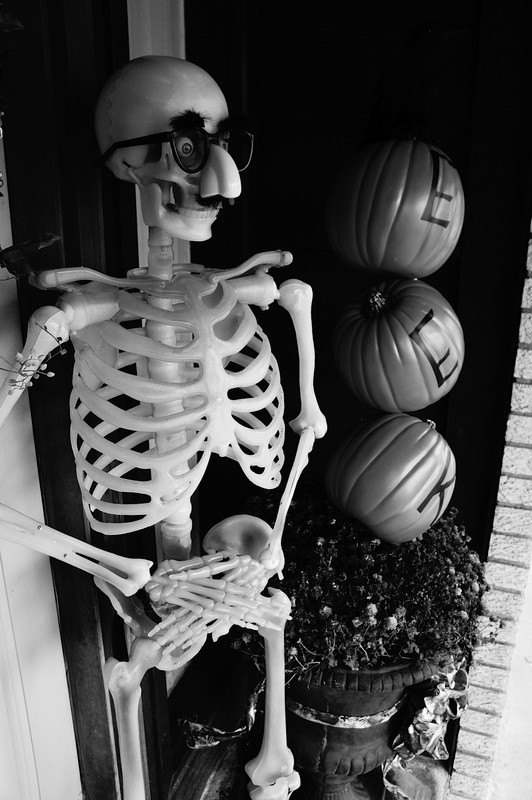 Moving on... my parents' neighbors have the best, most spooky, yet creative and fun house I have ever seen. Janice, is the leader of the pack. Let me tell you, this house is an eye-popper. Sit back and prepare to be amazed. Don't worry... I got 'em. This is hilarious. It makes me think of Janice's son. I had him in third grade last year and it was an absolute riot. That kid could make anyone laugh!! A+ baby... 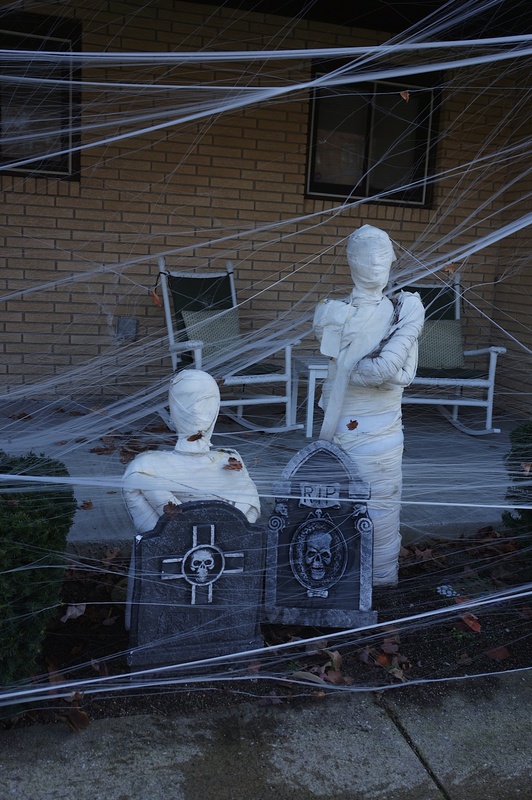 If their neighborhood had a contest, they would for sure win the blue ribbon! EEK!! 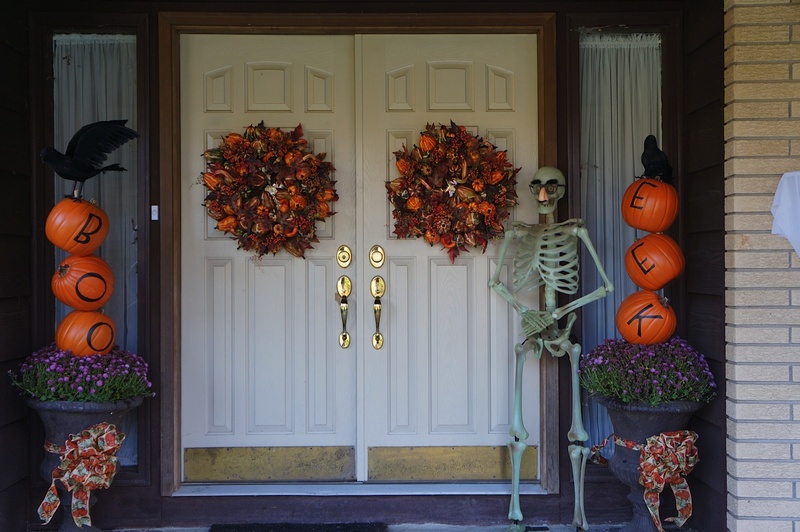 Enter if you dare! 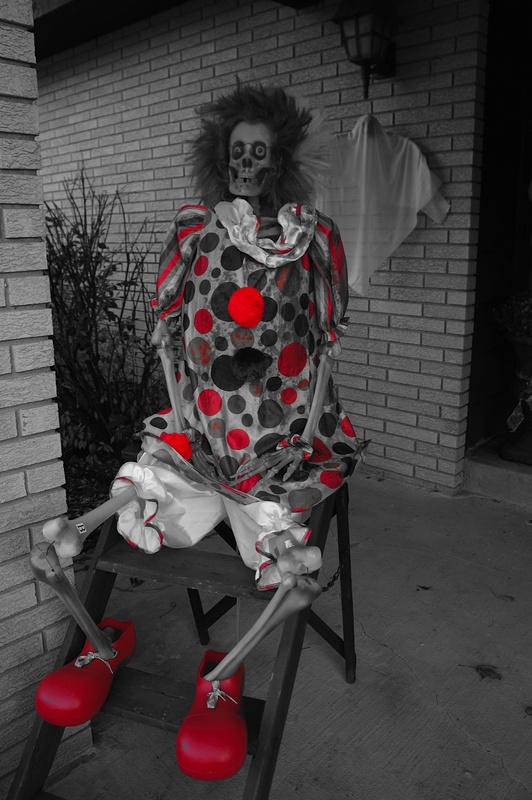 I hate clowns, but I love this guy! One more house to go... this is actually my husband's Aunt and Uncle's house in Fort Wayne. 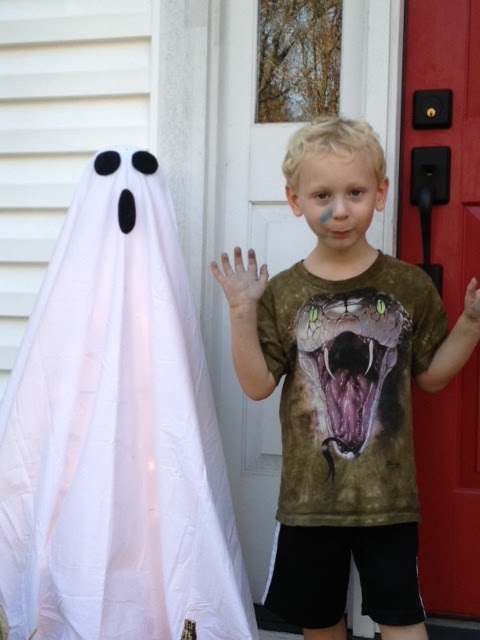 His Aunt Nancy is an interior decorator, too. I would love to spend a day with her!! Aunt Nancy is obsessed with flamingos for every season. It's freaking adorable. Look at those birds? Painted flamingos as skeletons?!?! You've seen it all here... on Copycat-Design!! 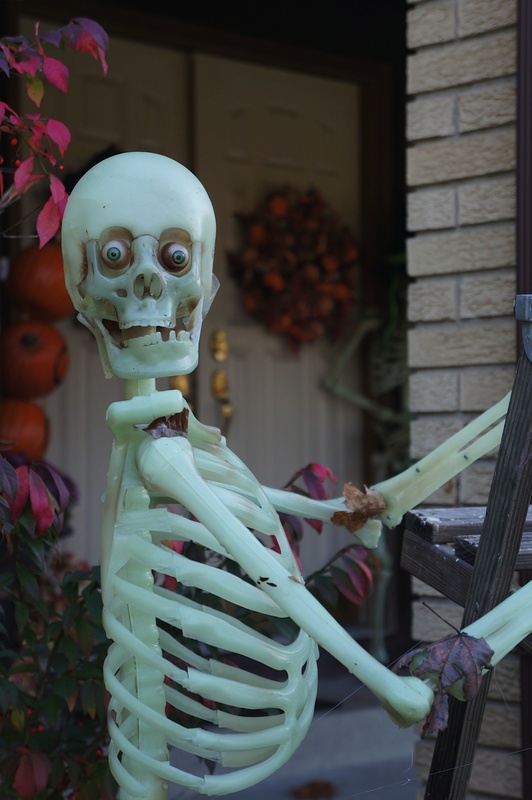 I wish you all a spook-tacular Halloween.